Well, I made the leap today and bought a HF 4x8 trailer on sale. I have a problem with the frame design. What has everyone else done with this trailer? Last edited by pchast on Thu Aug 07, 2014 1:31 pm, edited 9 times in total. Welcome to the wonderful world of Teardrops! 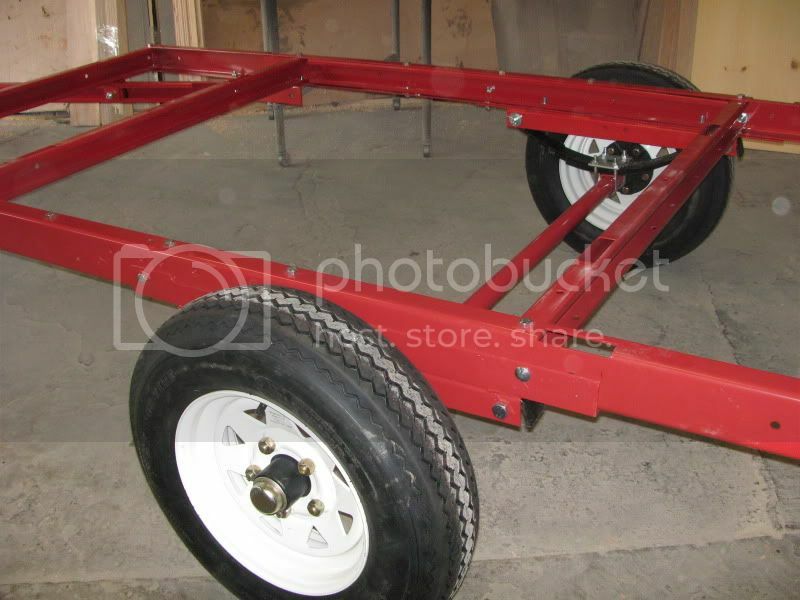 First , do you have the #1750 LB trailer? This is what I did with mine. I moved the axle 6" and took the cross members and and bolted them across the seam. Super strong now. I used the space between the frame rails for a drop floor. Yes its the same trailer. Makes sense what you did. I put it together how it was pictured first... I understand that you used the large opening for a dropped space. I did basically the same thing as wood butcher. I used the two center cross members to splint the two 4x4 halves together. I then used a 2x4 notched to fit into the frame rails to make a new center cross member. I still need to install the hitch on the wife's car and measure the ball height. We will not be going off road so no concerns there. No galley as its a bedroom for travel to more remote family and we do restaurants. I figure a hatch on the bottom rear maybe a foot by a foot for dirty stores. I was at the local HD today and grabbed a skid (10 pieces) of slightly damaged 1.5 inch 'blue' foam at a significant discount if I took all. So I'm kind of committed to a nice light foamy. Now to shop for electrics, a battery and some inside lights, maybe music. That should be more than enough foam, even if you have to cut some damaged areas out. I think you are the first of what I call the "Modern Foamie Movement" to cross over into the regular 'Build Journal' territory. I contemplated putting my build journal here, due to the similarities that my hybrid construction has with the traditional builds, but in the end decided to put it in the 'Foamie' section. This will be a good thing and should expose more people to the construction options that are available. Do you think you will go “pure foamie” with mostly foam and fabric, maybe some wood around the door jambs and frames? I’m curious to see what you come up with. The ‘no galley hatch’ design certainly lends itself to the simplicity of a pure foamie. I’m not clear if you have already placed your axle where you want it, or if you are still thinking about moving it. Either way, once you get it where you want it you can get a better idea on how low you can go with the under floor box just by lifting the tongue up until the back xmbr touches the ground (… or park one tire on a piece of string and string the line to the underside of the rear bumper). Allow a couple of inches for the springs to compress and there’s your answer; keep it inside of the line and it should never touch down before the steel frame, at least on paved roads. I tore the trailer back apart today and swapped sides for the spring mounts. This moved the wheel position back 6-8 inches. Its now 40 inches from the back of the 8 ft trailer. 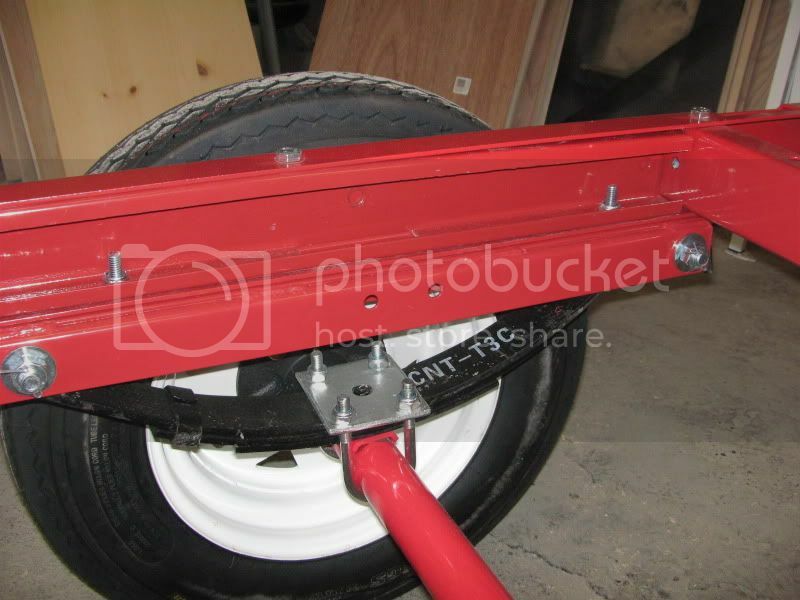 I won't know if its right until the build is finished and I can weigh the hitch with the trailer basically full loaded. 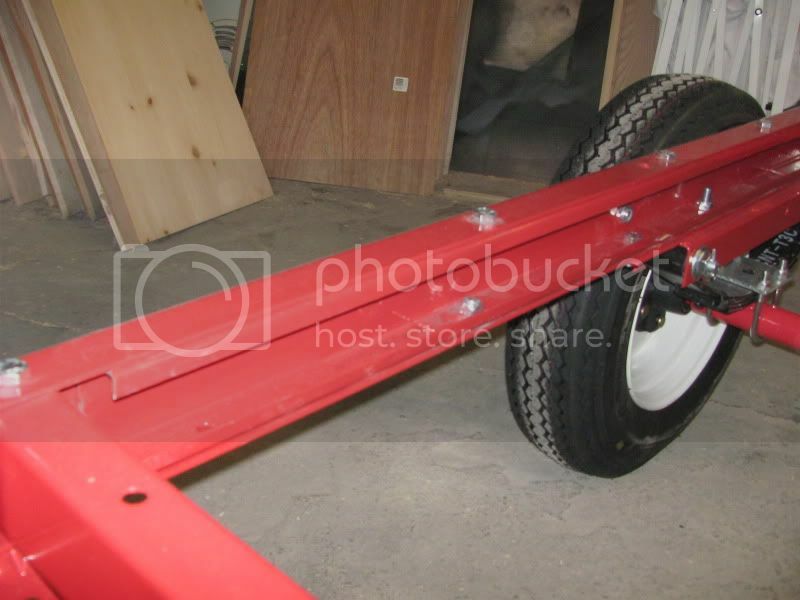 Any other location will require a lot of new holes and different support for the joined trailer halves. I've got plenty of Cedar (super light) for all needed reinforcement. I will use small blocks glued into the foam for attaching the door and windows. I don't know what shelves will be added after the shape is assembled. Any difficulty with gluing in wood later? That is one of the disadvantages to the foamie method; it is a lot better to know where all of the hard points need to be before the skin goes on. It has been posited that you can drill out points after the fact with a hole saw and glue dowels in (I think a GPW concept), but by my way of thinking the fabric patch would be a blemish no matter how fair it is. On my walls I will have a 5 mm inner ply skin and my cabinet frames are an integral part of the structure, so I have gone to great lengths to plan out each cabinet rail, bulkhead, and wall attachment point (coat hooks, dome lights, pillow/night/reading lights, fender attachment, porch light, etc., in the hopes that I don't have to add anything later. I really would like to have a nice clean finish on the inner wall skins w/o any patched up looking additions. I may even have to do a test fit of the cabin to chassis to make sure the fender supports go in the right locations, before adding the outer skin. Keep on keeping on, or as we like to say, build on! AHH. I don't think I will get that far. I'll get a floor set up and attach at least one side before mocking things up a little more. I need to get my wife more involved at that point. If I can temp set up that side all the better. I just haven't planned that far yet. I'm notorious for starting projects with one dimension and making all else fit it. It helps to talk it out here first. I appreciate your fielding all these discussions. I'll get some pictures out soon as I start the floor. Its been a busy week otherwise and I've done little more than refine the shape of the sides. to be accessible. Ability to unbolt the two or just re-tighten things sticks in my mind. I haven't seen much discussion about this... Please comment. glue things together. I'll fill the edges with trimmings and wrap the whole with cloth and lagging. blocking for the bolt down. Got to spend some quality time this morning with the foam. I Cleaned up the profile a little more. Then started gluing together the floor and figured out a story stick for curfing the roof. using the trailer for a work platform. figured out the door and a rear storage compartment. Its a busy next 2 weeks but I got some time in to check the trailer hitch height with the pickup. Its 2 inches higher when the bed is level. I purchased a hitch a couple of weeks ago and didn't check it out immediately, Mistake. The local mechanic, my friend, told me to leave it for him to install Tuesday. canvas or other suitable cloth. Then sourcing electrical stuff, wire and light. Larry was able to install the hitch on the Eos and left the electric for me to do. wires to the lights do not resemble the directions' color codes. What happened to the simple cars of our youth? I set up the roughed out sides so my wife could check it out and give 'provisional' approval.